You probably wouldn’t guess that someone born as Julius Frank Anthony Kuczynski would become a country music star. But even though his real name contains a clue to his original musical background, it would be his stage name — Pee Wee King — that would be remembered by fans. And even though he was a skilled accordionist and a good singer, he’s probably most remembered for his songwriting talents. Many of the best country songs that he wrote or co-wrote also crossed over and became pop hits. Songs like “Slow Poke,” recorded by Doris Day and others, or “Tennessee Waltz,” which became a huge number-one hit for Patti Page helped make King’s reputation. But it might surprise you to learn that he actually began his musical career leading a polka band. Young Frank Kuczynski, born into a Polish-American family in Milwaukee, followed in the footsteps of his bandleader father by launching his own band while still in his teens. Calling himself Frank King and fronting the band with his accordion and vocals, he began to appear on local radio and in stage shows during the 1930s, playing everything from polkas to Western swing. His fortunes took a jump when young Gene Autry, who was then a major recording star on his way up, chose King’s group as his backup band for his popular Louisville radio show. He also gave King his ‘Pee Wee’ nickname before later departing for Hollywood stardom. Although King would eventually appear in some movies himself, he continued to build his band’s popularity in Louisville before eventually joining the Grand Ole Opry in Nashville. By then, King was calling his band the Golden West Cowboys, and the famously conservative Opry was a little startled by the group. Not only was the style of music unusual — it still featured the occasional polka — but the group’s flamboyant costumes were certainly something new for audiences (although decorative Western suits would eventually become commonplace at the Opry). Over the next couple of decades Pee Wee King and his band would become fixtures on the country music scene. Vocalists like Redd Stewart (who co-wrote “Tennessee Waltz” with King), Eddy Arnold, and Cowboy Copas would often take over the spotlight as lead singer, but King was always the driving force. 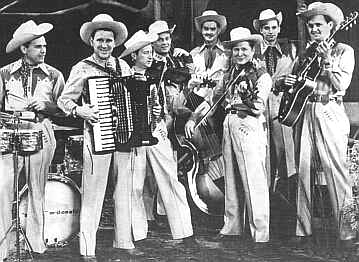 The band also worked with country stars like Ernest Tubb and Minnie Pearl, and in the post-war years even had its own TV show. By the late 1950s things were slowing down a little for Pee Wee King, but he continued to tour and perform wherever possible, gradually winding down over the next decade. He remained active in country music for a number of years as the director of the Country Music Foundation, and eventually died at age 86 in 2000.